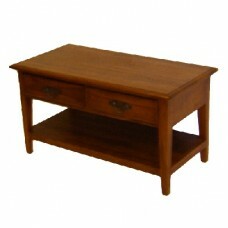 A TV Table which will look good with a 19 inch LCD right up to a 50 inch LCD or Plasma TV. It is not a dust magnet (you know what that glass stand is like) and you have 2 drawers to hide the remote controls and that DVD he won't put away because he will watch it soon-yes but when? (he will go mental). Most important of all-it look fantastic and it is ready to use: no assembly required. This TV and DVD Table is made in Indonesia and is 100% solid teak. All the sides and backs are solid teak. The drawer boxes and bottoms are solid teak and the back panels are fielded. The TV and DVD Table is pre built and cannot be dismantled. This TV and DVD Table is 100% natural timber and, as such, there may be slight shade and grain variations. This range represents the best quality at really sensible prices.